Tonight’s the night! The much-hyped Super Blood Wolf Moon (aka total lunar eclipse, in January, while the Moon is at perigee) is visible tonight from both Americas. 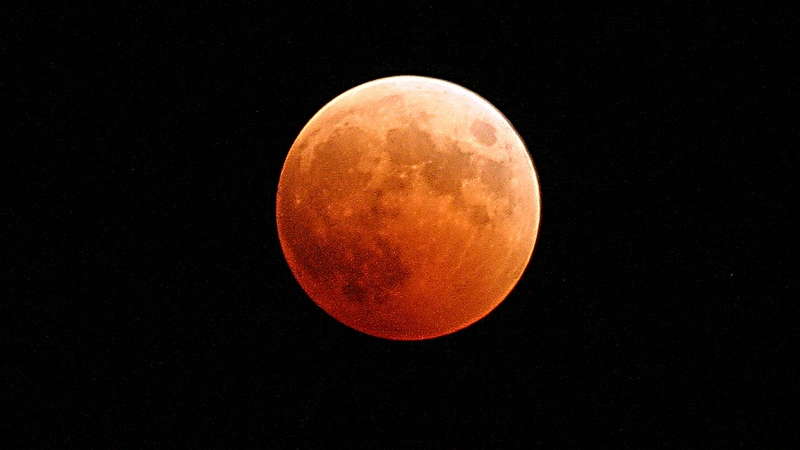 Western viewers get to see it in the evening, while Eastern viewers have to stay up a little later, but see totality when the Moon is at its highest. In the Caribbean, the Blood Moon of totality will be straight up. Eclipses are interesting events, partly because they are relatively rare, and they look cool – but also because the behavior of light allows us to use eclipses of any type (including occultations, when planets and moons cross in front of distant stars) to observe details about the bodies in question that might not otherwise be obvious. First, some basics — Lunar eclipses occur when the Sun, Earth, and Moon line up such that the Moon passes into Earth’s shadow. If you happened to live on the Moon (I don’t know anybody who does), you’d see the Earth slide across the Sun and produce a Solar Eclipse, from the Moon’s point of view. In this case, the Moon just happens to be near its closest approach to Earth in its orbit – it’s perigee. It actually won’t reach that point until about 14 hours after the eclipse, but that’s close enough to make a difference. The average apparent diameter of the Moon is 31 arc-minutes (about half a degree out of the 360 degrees that make up the full circle of the sky). Tonight, the Moon will appear to be about 2.2 arc-minutes bigger. Super! See if you can spot the difference. Earth’s shadow is pretty big, and it has two distinct parts – the umbra, and the penumbra. This two-part deal is a result of the Sun being a huge light source, and for most of an eclipse, only part of it is blocked. If you’ve ever walked down a dark street lit by overhead lights, you’ve noticed you cast multiple shadows, and truly dark shadow only occurs where the shadows overlap. That’s similar to what’s going on here – the shadow is a large bulls-eye shape, with an outer shadow (penumbra) caused by partial blockage of the Sun, and an inner, dark shadow (umbra) where the Sun is totally blocked. If you picture this shadow in 3-D, you might also be able to visualize that it’s cone-shaped. The umbra is Earth-sized right at the surface (what we call “night”), and gets narrower and narrower as you get farther away, since the Sun (enormous) is able to shine past us. Since the Moon is closer than average, it will be passing through an area of shadow that is larger than average as well. During tonight’s eclipse, the Moon will be in partial shadow for over 5 hours, and totally within the umbra (totality) for about 62 minutes – plenty of time to get a good look! 9:35 pm Eastern (2:35 am UTC) – the Moon will slide into the penumbra for the first time. This is not a clear, defined edge – remember this is the point where the Sun just barely starts to get blocked – so it may be some time before you can actually detect any shadow. Look for the lower left (celestial East) edge of the Moon to get indistinct as it passes into this partial shadow, and see how soon you can see it. On average, it’s detectable about 20-30 minutes in. 10:34 pm Eastern (3:34 am UTC) – Contact with the umbra starts. At this point, an arc of darkness will start to creep across the Moon, causing it to be nibbled away like a giant cookie. Sharp-eyed observers (or those with binoculars or a telescope) will notice that the edge of the shadow has interesting characteristics. First, it’s still fuzzy – again because the Sun is so big. This shadow is the result of the last bit of light being blocked, but it has been a gradual process as more and more light is blocked. Only the sudden switching off of a point light source would cause a sharp shadow. Second, notice the shape of the shadow? It’s pretty distinctly curved. Observers have noticed this for thousands of years, but Aristotle is credited as the first to actually record that lunar eclipses revealed the shape of the thing causing the shadow (Earth) – it’s round, spherical. 11:41 pm Eastern (4:41 am UTC) – Totality begins. The Moon will be in full shadow, and turn red. The Blood Moon will be hanging in the sky for over an hour. Enjoy it – it’s literally other-worldly. This color shift is wholly, completely, because Earth has an atmosphere. I think most of us know our planet has an atmosphere (breathing sort of relies on this) – but this is one of those observations that provide data when we watch eclipses or occultations with other bodies. Watch the Moon slide between us and a star, and it’s pretty clear there’s no atmosphere there – something we were able to determine long before we were able to send instruments there. Sunlight refracting through the atmosphere allows red wavelengths to bend around the planet, and it’s that red light that shines on the Moon during totality. In effect, the Moon is being lit by every sunset on Earth, all at once. If you were an observer on the Moon, you’d see the dark disk of the Earth, blocking the Sun, but surrounded by a red ring, and then backlit by the solar corona. Sounds awesome…. If the Earth HAD NO ATMOSPHERE, the Moon would disappear completely – a dark spot in the sky only detectable as it blocked starlight. That aslo sounds awesome, but a bit creepy, actually. 12:44 am Eastern (5:44 am UTC) – Totality ends, and the first slivers of direct sunlight start to reach the Moon again. This illumination quickly overwhelms the dim red glow of sunset, and the red color fades. A cookie-bite of darkness now starts to recede towards the right (celestial West) as the visible Moon gets bigger and bigger. 2:50 am Eastern (7:50 am UTC) – Eclipse ends. Take the time tonight, not only to enjoy the spectacle, but to use it as a unique opportunity to think about the big picture, the cosmic alignment, and your place in the universe. Our skies in the midwest are to improve by about eclipse time. I have my fingers crossed. Good luck and stay warm! I’m worried it will still be cloudy here, but hopeful! I did not know that thing about Aristotle. That’s really neat!